"It used to be Cliff and Vivian and now it isn't." With these words, Jim Harrison begins a riotous, moving novel that sends a sixty-something man on a quest of self-rediscovery. Newly divorced and robbed of his farm by his real estate shark of an ex-wife, Cliff is off on a road trip across America, on a mission to rename all the states and state birds to overcome the banal names men have given them. Cliff's adventures take him through a whirlwind affair with a former student from his high school teaching days twenty-some years before, to a snake farm in Arizona owned by an old classmate, and to the high-octane existence of his son, a big-time movie producer. 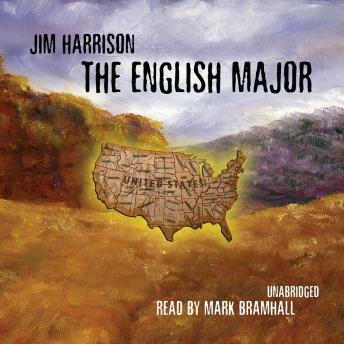 A map of a man's journey into-and out of-himself, The English Major is vintage Harrison: reflective, big-picture American, and replete with wicked wit.